"We have seen every conceivable repair an instrument could need." Whatever repair or restoration work your instrument is in need of, you can rest assured that we will carry out work to the highest standards. 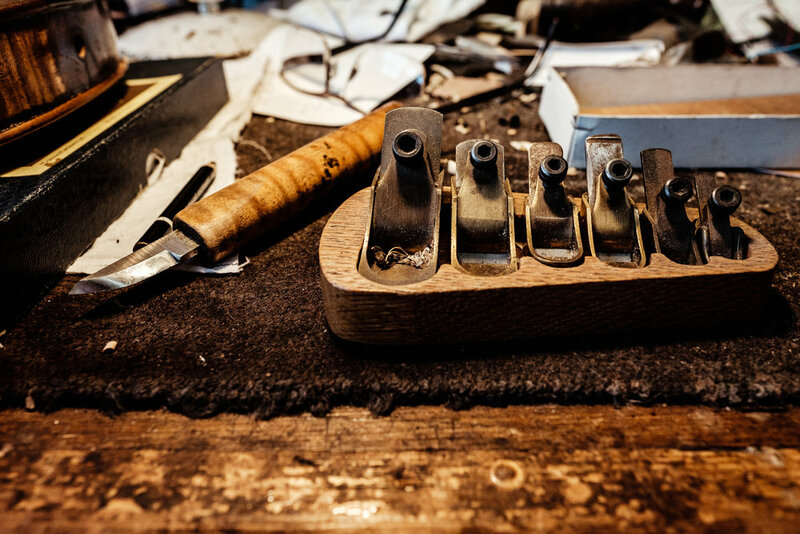 In the case of major restorations, we often photograph the step by step process which can sometimes involve rebuilding parts of the instrument. Small repairs are frequently carried out on the day. Using exacting measurements and the best quality products, we ensure that we set-up each instrument to enable it to perform to full potential. We use 'Despiau' bridges and the best quality tone wood for our sound posts. We carry an extensive selection of strings to suit every player. A sound post patch, neck graft or crack repair will take hours of painstaking work with many different processes involved. When instruments are subject to substantial restoration work, we like to work closely with the player and welcome their input. We often take photographs of the progress of the restoration so that a player can see intricacies involved. Bow restoration forms an integral part of workshop activity. We use only the finest Mongolian Horse Hair when rehairing a bow. We are often able to carry out rehairs by appointment while you wait. Other bow restoration work we offer includes; fitting a new face, re-cambering stick, fitting pearl slides, silver work and lapping of different materials. We can provide a free estimate for any work we undertake. If your instrument is subject to an insurance claim, we can deal promptly with the repair and paperwork on your behalf. We are agents for Allianz Musical Instrument Insurance.